Please click on the "How You Can Help" tab to make a direct donation via paypal or credit card and to read about other ways in which you can hep us. That there is a pet overpopulation means simply this: there are not enough homes for all the cats, kittens, dogs and puppies. As a result, thousands of healthy, adoptable animals are killed each year in Niagara alone. It is our failure to spay and neuter our pets that has brought us to this tragic situation. Consider this: one female cat and her offspring, in 7 years, can be responsible for the birth of 420,000 cats; one female dog and her offspring, in 6 years, can be responsible for the birth of 67,000 dogs. Pet abandonment is also a major contributing factor to the pet overpopulation crisis. In Niagara thousands of abandoned pets and feral cats suffer sickness, exposure, starvation and death on the streets and in the countryside as they attempt to survive on their own. Besides being the humane thing to do, there are many health benefits to spaying and neutering your pets! It will increase his/her chance of a longer and healthier life. Spaying a female cat helps prevent uterine and ovarian cancer. It will also help prevent mammary gland cancer, perianal tumors, and pyometra. Neutering your male cat prevents prostate and testicular cancer. Cats that have been spayed or neutered are less likely to roam and/or get into fights that can lead to serious bite wounds that spread diseases such as Feline Leukemia, Feline Aids, and Feline Infectious Anemia. 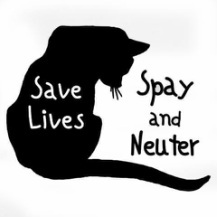 Since our founding in March 2012 we have assisted in spay/neutering over 1500 cats! If you would like to support our work by making a much needed financial donation, please click on the "How You Can Help Tab " and you will see a donation button allowing you to pay either by PayPal or by Credit card. Reducing the flood of unwanted animals is best done...by stopping surplus animals from being born in the first place.